With an escalating national debt, the talk at this month’s party conferences is one of cuts in public spending and smaller, more efficient government. I believe one clear way of achieving this would be to introduce a single unified brand across government. There are currently 24 ministerial departments and thousands of executive agencies, commissions, and authorities, each using different logos and identity packages. Numerous reorganisations under Gordon Brown have meant further identities, websites and publicity materials have been produced or made redundant. Not only do we have a government that appears fragmented and disorganised, but also one where successive change is expensive and wasteful. With a general election just months away, we can expect more of the same, especially when the Conservative party — widely expected to be the next party of government — plans to reduce the overall number of ministerial departments and executive agencies. I propose that any such reorganisation would be a perfect opportunity to rethink how the executive communicates with the public. If we want to reduce bureaucracy and simplify government, then we should also think about it being represented by a single identity rather than a multitude of logos. Whilst there is no coordinated branding strategy within the US Federal Government, there is some consistency, largely the result of historical precedent than any centralised planning. Here government departments, federal agencies and programmes use round seals, basing their designs on that of the Great Seal, or referencing aspects of it such as the Bald Eagle or the Stars and Stripes. 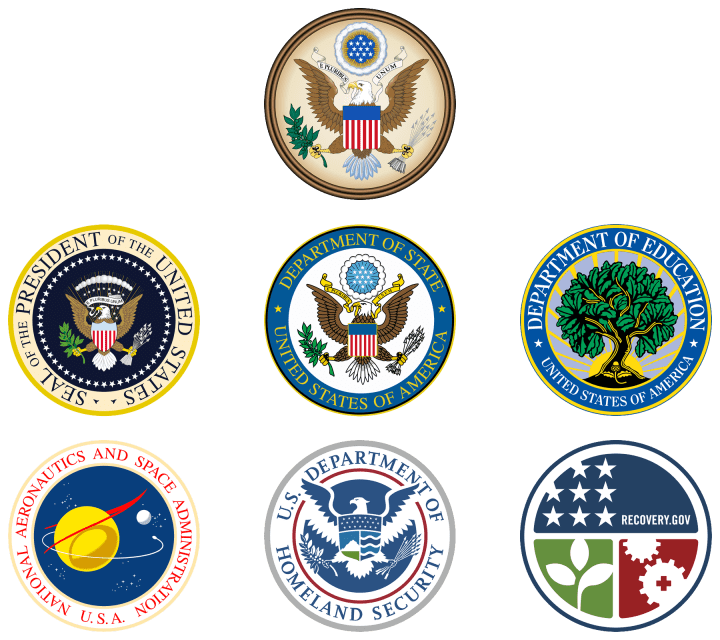 Seals of US Federal Government: The Great Seal of the United States and seals for the President, Department of State, Department of Education, NASA, Department of Homeland Security (DHS) and the Recovery.gov website. Both the DHS and Recovery.gov seals are recent creations, and whilst they have simpler designs, they still retain the circular format and visual language seen in other seals. The unification of East and West Germany in 1990 provided an ideal opportunity to create a single identity for the new federal government. A student competition held in 1996 was won by Jürgen Huber and Lisa Eidt. Their design combined the federal eagle, the German flag and a word-mark that could vary depending on department. They gained an internship at MetaDesign as part of their prize, and then worked with the agency to finalise the design. The final identity was launched in June 1999 and MetaDesign has been involved ever since. They continue to assist the federal government with implementation of the brand, designing tools and creating frameworks that allow ministries to still maintain a level of creative freedom. 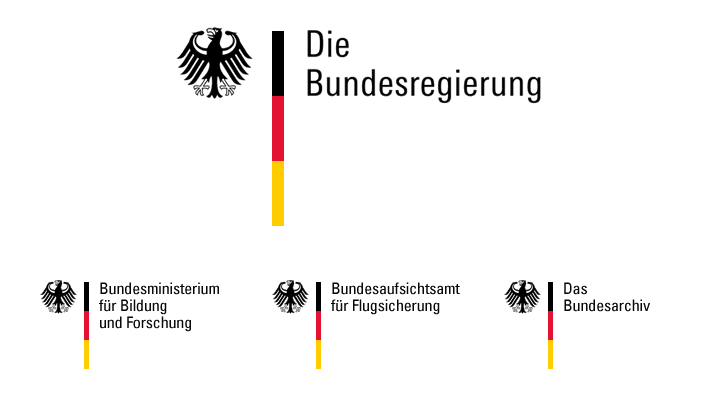 Logos used by the German Federal Government: One single (and scalable) identity system is used across all federal ministries and agencies. Shown here are logos for the Federal Goverment, the Federal Ministry of Education and Research, the Federal Supervisory Authority for Air Navigation Services and the Federal Archives. Last year the Dutch Government took a similar approach with it’s ‘Project 1 Logo’ initiative. With over 200 departments and ministries facing mounting costs maintaining different logos, typefaces, print materials and signage, the project aimed to improve communication between citizens and the government by presenting a unified image. The identity was created by Rotterdam based Studio Dunbar with a custom typeface (Rijksoverheid) designed by Peter Verheul. Announced in 2008, the roll out is intended to be complete by 2011. 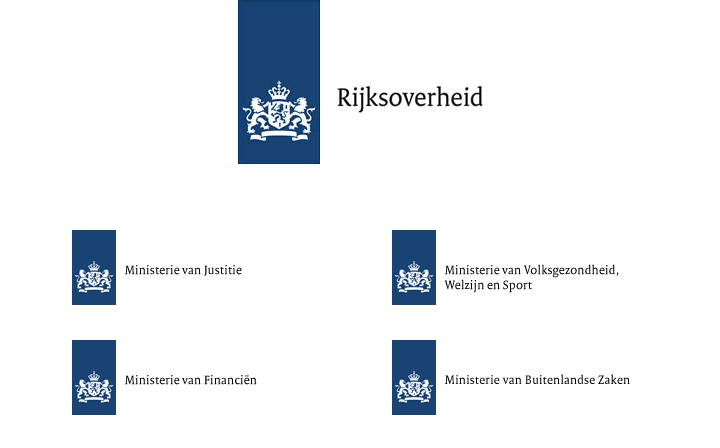 Logos for Dutch Government and ministries: A single identity system is used across the different Dutch ministries. Shown here are the main government logo are those for ministries of Justice; Health, Welfare and Sport; Finance and Foreign Affairs. Although a highly visible (and initially expensive) identity programme might meet some resistance in the UK, with a phased roll out, the long term benefits are clear. In fact, holistic branding exercises are already common within the public sector. The Northern Ireland Executive uses a cohesive identity across its different departments and the NHS in England has been using strict branding guidelines for several years. 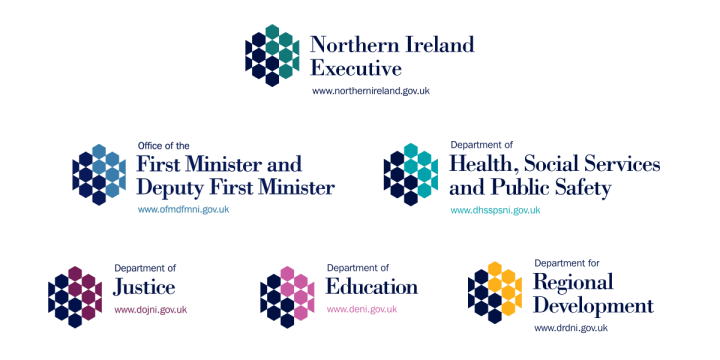 Logos for the Northern Ireland Executive and departments. The HM Government logo introduced earlier this decade could provide clues to what a unified identify might look like, with the government’s coat of arms sat alongside a word-mark set in Gill Sans Light. 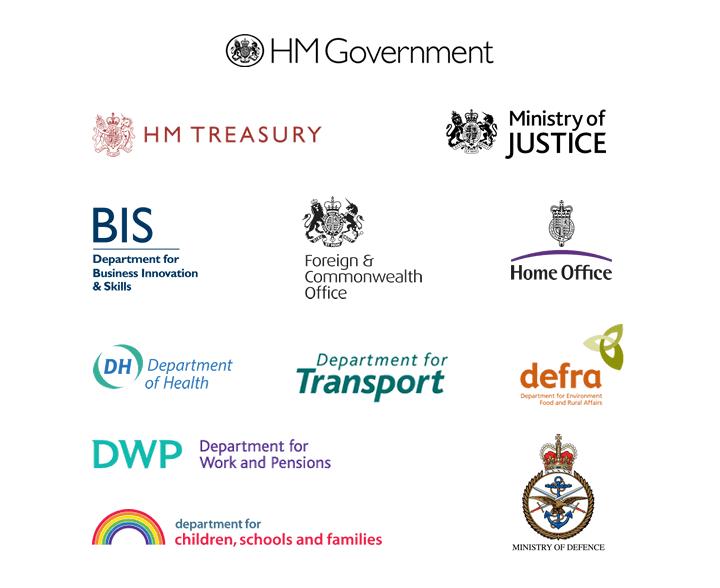 Logos for the Ministry of Justice, Treasury, Foreign and Cabinet Offices also feature this coat of arms, whilst the Treasury and the Department for Business Innovation and Skills use Gill Sans too. 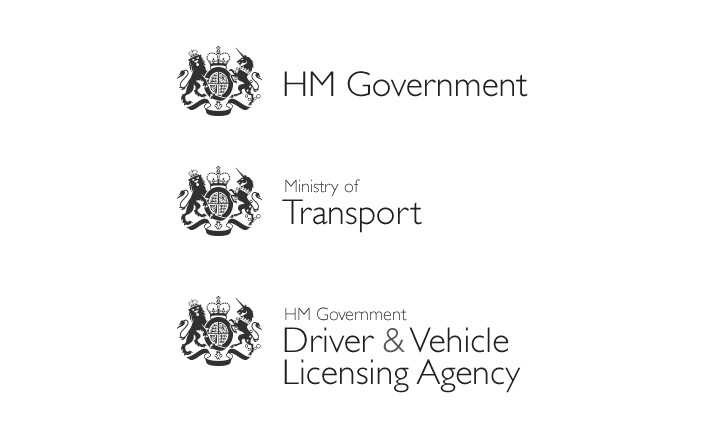 A selection of logos used by the British government today: Whilst there is no coherent identity within British Government, a number of patterns emerge, with the coat of arms and Gill Sans being popular choices for some logos. However not every department shares this visual language, and all have implemented separate identity schemes. Maintaining the coat of arms is probably a requirement for any future identity work, although it requires simplification; it clearly doesn’t resize well or reproduce cleanly enough on screen. While Gill Sans is often considered the de facto font for anything British, I would love to see a custom typeface designed in the same vein as that for the Dutch government. It would have to work across the wide spectrum of government activity, and heavy usage could result in it becoming a British classic (and arguably better suited to the requirements of the 21st Century too). There’s also a case to be made for simpler department names as many read like shopping lists. The Department for Children, Schools and Families and the Department for Environment, Food and Rural Affairs are two notable examples. Such naming schemes lead to meaningless abbreviations (i.e. DCSF and DEFRA) which further distances the government from the public. Personally, I would like to see departments named ministries again — partly because I’m a stickler for tradition — but this would also better associate departments with their ministers. Below is a suggestion as to how a unified identity might look, although I’m sure there are far more creative solutions. I’ve no doubt this is a massive project, one that would require a lot of research, and the resulting identity system would need to adapt easily to continual government reorganisation. Given the growing number of identity schemes implemented by other governments, it seems we are already behind. However there is still a massive opportunity for the British design community to think about how such a problem could be solved. That David Cameron rebranded his own party on becoming leader, I’m hopeful a similar exercise is soon seen at government level too.